Four Patella vulgata limpets in their natural habitat (here northwestern Galicia). One animal was separated from the rock and turned over to show the underside and muscular foot. Limpet is the common name for any of the marine gastropod mollusks comprising the order Patellogastropoda, characterized in extant forms by a flattened, conical or cap-shaped shell and a suckerlike foot without a protective operculum. While patellogastropods are the true limpets, as the term limpet also is broadly applied as a common name for many marine and even some freshwater snails in other taxonomic groups that have a simple shell that is more or less broadly conical or "patelliform" in shape, and which is either not coiled, or appears not to be coiled, in the adult snail. For example, keyhole limpets in the family Fissurellidae resemble true limpets because of their simple conical shells, but in reality they are not closely related to true limpets. This article will be limited to the true limpets in the order Patellogastropoda. Patellogastropods serve an important ecological role in food chains, grazing on algae and marine angiosperms and being an important food source for shore birds, fish, mammals, crabs, sea stars, and so forth. For humans, larger limpets also have served historically and presently as a food source, and also appear in artwork and as jewelry. Their presence also assists in the monitoring of ecosystem health. Limpets are members of the mollusk class Gastropoda. Gastropods are also referred to as univalves since most have a single shell, or valve, which is characteristically coiled or spiraled, as in snails, limpets, abalones, cowries, whelks, and conches. However, some gastropods, such as slugs and sea slugs (nudibranches), lack shells and some even have shells with two halves, appearing as if bivalves. Gastropods typically have been placed into two subclasses: Orthogastropoda ("true snails") and Eogastropoda ("true limpets") (Ponder and Lindberg 1997). However, in the taxonomy of Bouchet and Rocroi (2005), the Patellogastropoda have become an unranked taxon as a separate clade. The term limpet is an inexact term, which is fairly often used as part of the common name of a wide variety of different marine and freshwater gastropod species, some of which have gills and some of which have a lung. The name is given on the basis of having a flattened, cone-like shell ("patelliform"), but the several groups of snails that have such a shell are not at all closely related to one another. The phrase "true limpets" is used only for marine limpets in the ancient order Patellogastropoda in the subclass Eogastropoda. Among mollusks in the subclass Orthogastropoda for which the term limpet is used are such marine forms as the keyhole limpets (Fissurellidae), slipper limpets (Calyptraeidae), hoof limpets (Hipponix), the opisthobranch notaspidean limpets such as Tylodina and Umbraculum, and the pulmonate false limpets (Siphonaria). The name also is used for the freshwater pulmonate river and lake limpets Ancylidae and Acroloxidae. Most of the marine "limpets" have gills, whereas all the freshwater limpets and a few of the marine limpets have a mantle cavity that is adapted to breathe air and function as a lung (and in some cases has been again adapted to absorb oxygen from water). These various kinds of snail are only very distantly related. In other words, the name limpet is used to describe various extremely diverse groups of gastropods that are united only by having the same basic shell shape (an example of convergent evolution). All living limpets (order Patellogastropoda) have flattened, cone-shaped or cap-shaped shells, with the apex of the shell commonly situated either at the center of the shell or somewhat towards the anterior (Lindberg 2005). All shells have concentric growth lines, and many species have additional radial ribs that extend from the shell margin to the apex (Lindberg 2005). Shells of subtidal species are typically white or pink in color and intertidal species are typically gray or drab brown with white spots and radial rays (Lindberg 2005). Many limpet shells are often covered in microscopic growths of green marine algae, which can make them even harder to see, as they can closely resemble the rock surface itself. Limpets range in size from about 5 to 200 millimeters (0.19 to 7.9 inches) in length (Lindberg 2005). Until quite recently, a west Mexican limpet species, the giant limpet, Patella (Ancistromesus) mexicana, was known to grow as large as 20 centimeters (7.9 inches). This species is now in serious danger of extinction, as it is slow to reach maturity, and has suffered from overcollecting, both as a food item, and by shell collectors and dealers. The head has one pair of tentacles; the mouth opens ventrally for feeding and has a radula that typically has very few robust teeth (Lindberg 2005). Two gill configurations are found in patellogastropods. In some (classically the suborder Patellina), the gills are found around the edge of the food and extend around the aperature, while in others (classically, the suborder Acmaeina), the gill is found over the head (Lindberg 2004). The majority of patellogastropod species are commonly found adhering strongly to rocks or other hard substrates, looking like little bumps on the surface. They attach themselves to the substrate using pedal mucus and a muscular "foot." They move using wave-like muscular contractions of the foot when conditions are suitable for them to graze. They can also "clamp down" against the rock surface with very considerable force when necessary, and this ability enables them to remain safely attached, despite the dangerous wave action on exposed rocky shores. The ability to clamp down also seals the shell edge against the rock surface, protecting them from desiccation during low tide, despite their being in full sunlight. Representatives from the order Patellogastropoda, the true limpets, live on the rocky coasts of all oceans worldwide. Various different species live throughout the intertidal zone. In deep sea, they are found at both hydrothermal vent sites and cold seep sites, and in near-shore subtidal habitats, they commonly are associated with calcareous substrates (Lindberg 2004). Patellogastropods often clamp down on rocky substrates. When true limpets are fully clamped down, it is near impossible to remove them in one piece from the rock using brute force alone, and the limpet will allow itself to be destroyed rather than stop clinging to its rock. This survival strategy has led to the limpet being used as a metaphor for obstinacy or stubbornness. Many species of limpets adhere to plants as substrate, including to brown algae, red algae, and marine grasses (Lindberg 2004). Such marine plant limpets are found in all major oceans except the Arctic Ocean (Lindberg 2004). Patellogastropods are grazers, generally feeding on algae that grows on rocks or other surfaces. Limpets scrape up films of algae with a radula, a ribbon-like tongue with rows of teeth. In some parts of the world, certain smaller species of true limpet are specialized to live on seagrasses and graze on the microscopic algae which grow there. Other species live on, and graze directly on, the stipes (stalks) of brown algae (kelp). Limpets generally will remove diatoms, algal spores, and bits of plant matter from the substrate, with only a very few species able to feed directly on large algae (Lindberg 2004). Equal-size blunt radular teeth are common in species that feed on coralline agae, and unequal-sized, pointed radular teeth are common for species that graze rock substrates, and broad, flat-topped teeth are common on species that feed on marine angiosperms (Lindberg 2004). 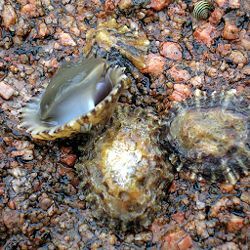 Limpets are preyed upon by a variety of organisms, including starfish, predatory gastropods, shore-birds, fish, lizards, small mammals, seals, and humans. Oystercatchers and other shore birds can be especially voracious predators (Lindberg 2004). At high tide, moving patellogastropods are vulnerable to aquatic predators, and at low tide are vulnerable to shore birds and mammals (Lindberg 2004). Limpets in the intertidal of Cornwall, England. Common limpets in Pembrokeshire, Wales. Some species of limpets return to the same spot on the rock known as a "home scar" just before the tide recedes (BBC). In such species, the shape of their shell often grows to precisely match the contours of the rock surrounding the scar. This behavior presumably allows them to form a better seal to the rock and may help protect from either predation or desiccation. It is still unclear how limpets find their way back to the same spot each time, but it is thought that they follow pheromones in the mucus left as they move. Other species, notably Lottia gigantea, seem to "garden" a patch of algae around their home scar (Shanks 2002). Lottia gigantea also are one of the few invertebrates to exhibit territoriality and will aggressively push other organisms out of this patch by ramming with their shell, thereby allowing their patch of algae to grow for their own grazing. Also, where the limpets eat the algae off bare rocks, it creates places where other organisms can grow and thrive. Spawning typically occurs once a year, usually during winter, and is triggered by rough seas that disperse the eggs and sperm. The eggs are usually small, only about 0.0035 inches (0.09 millimeters) in diameter (Lindberg 2004). Some larger species produce millions of eggs annually, but some smaller species, that produce much fewer eggs, may spawn year-round (Lindberg 2004). The larvae go through a trophophore and veliger stages before settling and undergoing metamorphosis to the adult (Lindberg 2004). Some species offer brood protection, with some taxonomic groups having internal brood chambers, and some species retaining the eggs in the mantle cavity but after fertilization the eggs develop into crawl-away young (Lindberg 2004). Limpets can be long lived, with tagged specimens surviving for more than 10 years. Larger limpet species are, or were historically, cooked and eaten in many different parts of the world. They have been part of diets for more than 150,000 years (Lindberg 2004). In Hawaii, limpets (Cellana species) are commonly known as ‘opihi (Lo 2007), and are considered a delicacy. In Portugal, limpets are known as lapas and are also considered to be a delicacy. Limpet size is believed to be reduced due to human predation (Lindberg 2004). Some limpet species are used in shell jewelry (Lindberg 2004). They also have appeared in art, with War: The Exile and the Rod Limpet (1842) being a well known classic in which Napoleon Bonaparte is seen contemplating a specimen of Patella while exiled on St. Helena (Lindberg 2004). Limpets also are used for biological monitoring of ecosystem health (Lindberg 2004). BBC. n.d. Common limpet. BBC. Retrieved August 15, 2008. Lindberg, D.R. 2004. In B. Grzimek, D.G. Kleiman, V. Geist, and M.C. McDade, Grzimek's Animal Life Encyclopedia. Detroit: Thomson-Gale. ISBN 0787657883. Lo, C. 2006. On the rocks. Hana Hou! 9(6). Retrieved August 15, 2008. Ponder, W.F., and D.R. Lindberg. 1997. Towards a phylogeny of gastropod mollusks: An analysis using morphological characters. Zoological Journal of the Linnean Society 119: 83-2651. All links retrieved July 23, 2018. Acmaeidae at the NCBI taxonmy website. This page was last modified on 23 July 2018, at 14:11.